The Aircraft Maintenance Technology program at Greenville Technical College (GTC) is approved by the Federal Aviation Administration (FAA) and Veterans Affairs and provides students with the technical, mechanical and academic skills needed to become aircraft maintenance technicians. Graduates are qualified to take the FAA Airframe and Powerplant Technician Certification exams, and students consistently earn top scores along with the higher earnings this credential allows them to command. More information about the programs and specific courses can be found here. A unique feature of the AMT program is GTC’s partnership with Embry-Riddle Aeronautical University, which gives students access to expanded educational opportunities in the aviation field. Bachelor’s degrees in Aviation Maintenance Management, Professional Aeronautics, and Technical Management allow students to begin at GTC and finish at Embry-Riddle. Many students already employed with companies like Lockheed Martin, Honeywell, Stevens Aviation, General Electric, Greenville-Spartanburg Airport, Michelin and others, find this program can increase their skills and potential. HGTC also has a partnership with the Pittsburgh Institute of Aeronautics (PIA) and their Aviation Maintenance program, which provides a specific pathway for students who want to work in the fast-growing aviation industry. The unique partnership with PIA enables the HGTC student to earn an Associate of Applied Science while learning the nuts and bolts of aircraft maintenance. 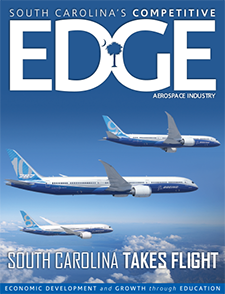 The Technical College of the Lowcountry (TCL) started its aviation technology program in March 2013 with an Airframes and Powerplant (A&P) preparation course and a Federal Communications Commission (FCC) licensing course. Since then, it has transformed into a program focused on military aircraft mechanics wanting to translate their skills into a license useful in the private sector. Nearly one-third of TCL’s student population falls under the categories of active duty, reserve, guard, veteran or dependent. Programs and services have been designed, and recently expanded, to meet the needs of those students to be designated as a military-friendly school. “We think it is important for the community to understand the programs here at the college that are helping our military population transition into skilled labor jobs in the Lowcountry,” Henrickson said. Through the aviation professional program, opportunities are available to gain licenses that facilitate employment at regional aviation giants such as Gulfstream and Boeing. Graduates have been employed by Gulfstream Savannah, Boeing, GE Aviation, Hondajet, Sky Quest Aviation, Naval Aviation Depot and Wyle Defense, to name a few. The SC Technical College System is committed to supporting the state’s growing aerospace cluster. To prepare for the escalation of training needed to provide a skilled workforce, Trident Technical College (TTC) will construct the S.C. Aeronautical Training Center on its Main Campus in North Charleston. The $79 million facility will increase capacity to provide training for well-paying jobs in expanding advanced manufacturing industries that have diverse workforces and excellent upward job mobility. Barring delays, the college anticipates construction will be completed in 2019. The S.C. Aeronautical Training Center will house the college’s Aeronautical Studies academic programs as well as aeronautical training offered by the college’s Division of Continuing Education and Economic Development and readySC™. The new facility will add more training space and increase efficiency by consolidating classrooms and labs now distributed across two campuses and five buildings into one location. “For South Carolina to have the ability to absorb the workforce requirements of suppliers as well as Boeing, we need added capacity to train workers. This new facility will position our state to meet the needs of the rapidly expanding aerospace cluster,” said Dr. Mary Thornley, president of Trident Technical College.